The bigger the brand, the more critical it is to protect its reputation. In a globalized economy, with international branches, franchises and outsourced operations, this presents a major challenge for brand owners. Transparency should be a key element in every brand protection strategy. To consumers, it sends a strong message of commitment to quality, respect and trust. It enables organizations to actively prevent the reputational damage that follows poor service, and reap the payback of positive market positioning and customer retention. Brand owners with distributed operations can take steps to develop a policy of transparency, by ensuring their partners have the right toolset. ServeMeBest has developed that toolset, backed by the world’s first Customer Service Transparency Standard. ServeMeBest offers a suite of innovative services designed for international organizations that see transparency as a way to enhance their brand. With a focus on the telephone channel, the services use mobile technology to strengthen the trust relationship with consumers via a number of innovations. One service, Trust+, enables customers to easily get a copy of their customer care call recording. Another, Survey+, uses mobile surveys so that the brand owner can keep its finger on the pulse of customer satisfaction, and accelerate the response to customer concerns. The Customer Service Transparency Standard (CSTS) is a new mark of trust independently audited and certified by AJA Group. Certification provides a clear signal of commitment to the highest standards of transparency. With a cloud architecture and flexible licensing model, ServeMeBest makes it easy for brand owners to deploy and scale services as required. By encouraging channel partners and outsource services to adopt transparency technology, and CSTS certification, brands can proactively ensure service quality is maintained at a high level, and their brand investment is protected. Years of effort and huge resources are needed to build a global brand. But whether it be that of a bank, hotel chain or motor company, the respect for the brand is built on the quality of the customer experience, not the size of the advertising budget. With a smartphone in every pocket, reputational damage is just a click away. This makes it essential to take steps to actively avert problems, and not take a fire-fighting approach. Quality and trust are interwoven and every brand owner should keep an unwavering focus on maintaining high standards. However, this is not easy, especially in international organizations and those that outsource customer services. Franchising and outsourcing are two operational models that are popular for a good reason – they work. They enable organizations to expand and grow quickly. They offer flexibility, and the ability to adapt to local market conditions. Most importantly, these models are efficient and financially beneficial. The downside factors are also well known. The brand owner becomes remote from their customer, risking a delayed or suboptimal response to customer needs. The franchisee or outsource company may have priorities that are not aligned with the brand, and the customer experience can suffer. Put bluntly, the drive to control costs will almost always drive down quality too. A poor customer experience inevitably leads to negative social shares, and brand value erosion. That’s why averting problems is preferable to constant monitoring and trouble-shooting. A new approach, backed by a new standard, offers brand owners a positive and proactive way to maintain quality through increased transparency in customer care. Transparency is coming to customer services and top performers use it to gain a competitive advantage. By making a transparency statement, the brand sets itself apart from others, shows respect for customers and demonstrates a commitment to trust. Transparency takes many forms. Simply identifying staff by name is easy – yet how many times have you received an anonymous email or letter from a customer contact centre? Other forms will require technology upgrades, for example to share live information on product delivery times. A good example of practical transparency is chat session sharing. On-line chat is a growing channel for pre and post sales care, and it is common to be offered a transcript of the session afterwards. It’s simply a useful feature, to review information, or for verification of a promise. A logical extension of this is call recording sharing, but this has not so far been done – in part due to absence of suitable technology. Yet, sharing call recordings is not just a positive marketing statement. It offers tangible benefits that lead to customer retention, enhanced brand value, reduced complaints and a positive financial return. 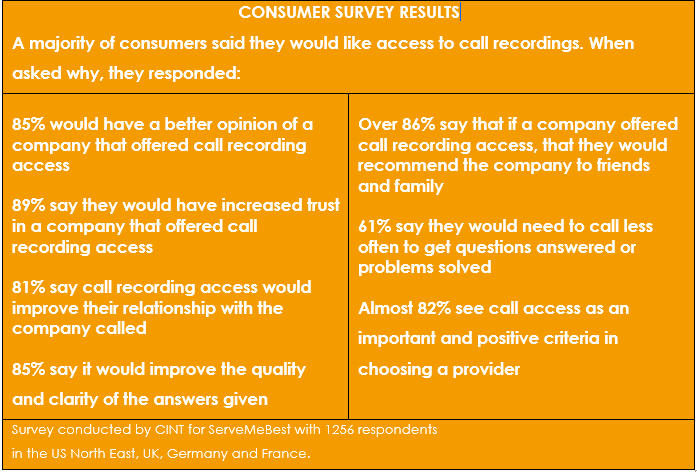 For brand owners, adopting a policy of transparency in call recording has double benefits: consumers love the idea; and it acts to maintain the quality of customer care proactively, thus averting the problems that can damage brand reputation. A convergence of consumer demand, government regulation and technology availability will bring shared call recording to the customer care sector. Transparency in call recording is more than an innovative marketing tactic. There are forces at work that will make it imperative. The first is the increasing assertion of consumer rights, and the response of legislators. Rules vary by State and Country, but the norm is that callers must be notified of call recording, in recognition that the recording will contain their personal data. However, once the recording exists, there is an imbalance of access – if there is a dispute, only the organization that holds the recording has access. EU data directives mandate that callers must be given a transcript of the call on request, but not necessarily the recording. This does not sit well with consumers. An indication is that a change.org campaign has started in the US to lobby legislators to mandate recording sharing. Meanwhile when surveyed, consumers are overwhelming positive to the idea, and it’s not just because of dispute resolution. They see practical benefits, as shown below. Typically, today’s call recording systems are not designed with recording sharing in mind. Now, that has changed, with ServeMeBest offering a cloud service specifically designed to make it easy for service providers to share the recording using mobile technology. This removes the technology barrier. Brand owners have a particular incentive to promote transparency in call recording. 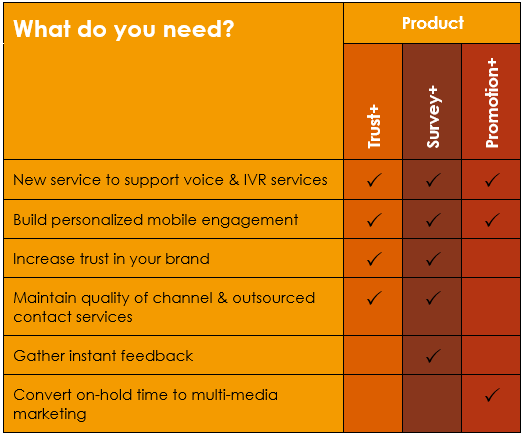 Whatever the sales structure – branches, franchises, resellers – shared call recording provides a means to maintain service quality in the channel, and avert damage to brand reputation. If customer care operations push back on recording sharing, brand owners should ask why? Is it a telltale sign that operations know that their service is not up to standard? Recording sharing is the enemy of poor quality performers: those who delay, who don’t fulfil promises, give incorrect information or are discourteous. While poor performers may see recording transparency as a threat, the good performers will see the opportunity. In fact, there are positive benefits for all parties, as listed in the table below. ServeMeBest is focused on innovation in services that bring transparency to customer care. The services can be deployed by any organization of any size that offers customer service by phone. They are of particular benefit when the brand owner is one step removed from the customer, due to a franchise or outsource model. In practical terms, transparency means showing respect for customers, and building trust. That’s why the flagship ServeMeBest product is called Trust+. It’s a ground-breaking call recording service with the unique ability to share recordings with the caller. As a standalone cloud service, it does not have any impact on current recording system. It uses IVR, SMS and the web to conveniently and securely offer callers the option to receive a link to a copy of a customer care call recording. The call recording offer is included in the IVR welcome that callers hear when they call the contact centre. If the caller elects to receive a copy of the recording, their mobile number is captured. The call is then routed via the Trust+ recording service using standard telephony protocols. After the call, the caller receives an SMS with the link to the call recording, and can play or download the recording. Service providers can access the Trust+ service via a secure web interface, and perform functions such as playing recordings and resending links to callers. Built on the same platform, Survey+ is also designed to enhance trust, by enabling concise mobile survey deployment immediately after an interaction. It is designed to offer concise post-contact surveys via SMS and the mobile web. It can be deployed as a standalone solution or as a plug-in to Trust+. A third service, Promotion+, enables the service provider to show respect for callers by not subjecting them to endless and repetitive in-call marketing. Instead, it enables callers to take the option to receive offers as mobile marketing messages. Promotional messages can be easily and frequently changed, to keep the experience fresh. To maximize the marketing potential of transparency, ServeMeBest has developed a Customer Service Transparency Certification (CSTS) programme, independently audited by AJA, a global registrar. For the first time, organizations who implement transparent processes, such as call recording sharing, can attain independent third party certification, and display the Certified Transparent mark. The standard is administered by AJA, with offices in 34 countries worldwide. AJA is a member of Praxity, the world’s largest Alliance of independent accountancy firms. Designed for the cloud and highly customizable, ServeMeBest services can be quickly deployed in ways suited to local market needs. ServeMeBest recognizes that flexibility is required in order to meet the needs of international brands, as structures range from tight (a fully owned branch network) to contracted franchisees and resellers. 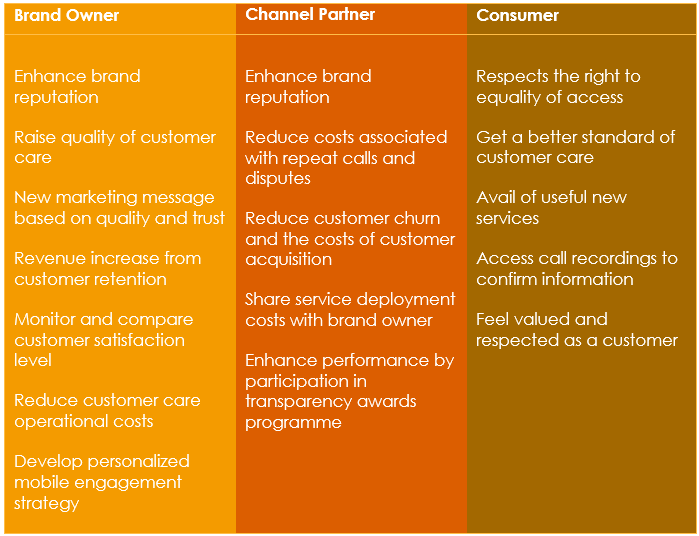 Customer care operations may be internal, operated by channel partners or outsourced. A model for deployment of ServeMeBest services and CSTS certification is illustrated below. ServeMeBest service licences are based on usage, and communications costs (SMS) may be bundled on request. CSTS certification has an annual fee. Where company structures allow, licences may be shared over multiple sub-entities to reduce costs.